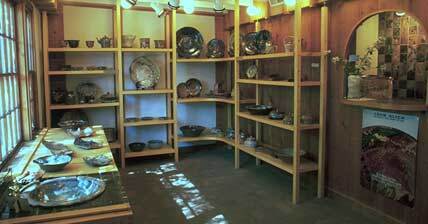 Visitors have always been able to see my work by coming to the Showroom at Plum Tree Pottery. There they see a cross-section of the ceramics I'm presently doing. In the Showroom, the emphasis is on functional, as well as more decorative works, so many pots for daily use are displayed - baking dishes, casseroles, cups and saucers, mugs, tumblers, bowls, plates, serving trays, lidded jars, boxes, teapots, pitchers, vases and much more can be found here. The SALES GALLERY is closed.